Hail Storm Has Hit Albuquerque New Mexico May 21, 2018! Hail damage isn’t always easy to spot or identify. The shape and size will vary due to hail size, wind speed, and direction. You cannot always recognize hail damage from the ground, but the following steps Hollywood Roofing has provided will be a good indication if you do in-fact have hail damage to your roof. Check around the downspouts, some are made from a softer metal that can show hail impacts more prevalent. Hail damage is when hail hits the shingles of a roof with such an impact that it degrades the shingle down to exposing the fiberglass mat. In most cases, this damage cannot be seen by the unqualified eye. If you have standard asphalt, laminate shingles on your house, you’ll want to check around the downspouts or drive-way for excessive tile granules. If evident, there may be a positive indication of roof damage due to a recent hail storm. However, this may simply be due to the age of the roofing material that causes degranulation due to natural weathering. Dent-check the gutter and downspouts. Inspect all of your downspouts’ sides and gutters at the bottom for dents. Some of the newer gutters and some mail-boxes are thin enough that hail, the size of a marble, will easily dent the metal. 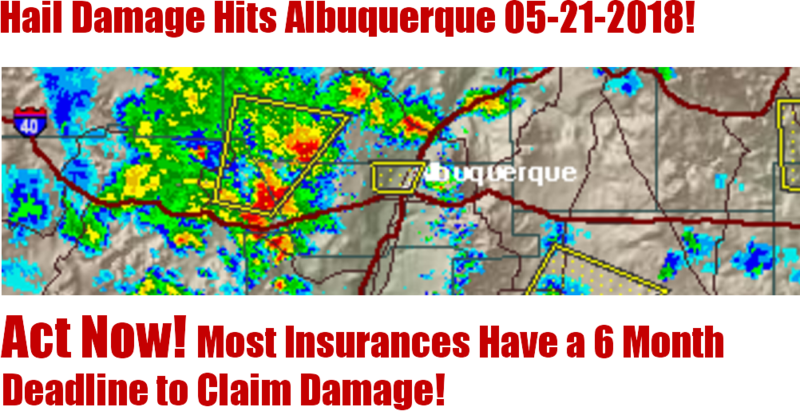 Once again if damage is evident, then the possibility of roof damage exists. Inspect for leaks. Hail damage is not always obvious or prevalent from the ground or to an untrained professional. Often enough, hail damage is not discovered until after leaking or other serious, inside damages occur. Damage caused by hail does not immediately cause leaks. As hail, damaged shingles degrade, your roof may begin to leak due to the fiberglass mat exposed. Inspect your interior ceiling after heavy rains for any apparent water damage or moisture. Inspect the roof. Please only do this if you have easy access to your roof and the slopes are not that excessive like porch roofs. To be on a roof is dangerous, and Hollywood Roofing will inspect it for free. If your roof is accessible and walkable, look at the vents, the drip edge, the fascia, and your gutters for signs of damage including splash marks on heavier metal types. Look at the roof shingles for circular dimple or areas where the shingle granule is missing–usually observed as dark circles. Hail might produce a “dent” or a damage point in an asphalt shingle roof surface, resulting in granule loss and reduced remaining roof life due to exposed fiberglass mat. If you have 10 hits in a 10 ft. square, your roof needs replacing. Most shingle manufacturers do not cover hail damage in their warranties. Take action. If any of the steps above result in our listed indications, call Hollywood Roofing. We will come out immediately to inspect your roof for free. If you have necessary damage to warrant a new roof, we will guide you through the complete process to make it as easy as possible. First, our company will walk you through the process at no added cost. It is our privilege to help you and guide you through the entire process. Call your insurance company and file a claim, mention the date corresponding with your recent hail storm. To do this, you can call your agent and they can direct you to the proper claims department. After filing a claim, an insurance adjuster will be assigned to your claim number. Typically, this occurs within 4-7 days from your original call. After the adjuster is assigned to you, he or she will make contact you, the homeowner, and make an appointment to inspect your entire property. Notify Hollywood Roofing when you have an appointment set, so that we may meet your adjuster at your property. Hollywood Roofing has insurance claim specialists that are experienced in hail damage claims to make sure your adjuster accurately calculates present damage. Once an agreement has been decided between Hollywood Roofing and your adjuster, the adjuster will submit the paperwork to your insurance company. The insurance company will review the paperwork and send you an adjustment summary of your claim in approximately 5-7 business days. Once you get your summary, call Hollywood Roofing to set an appointment so that we can make sure everything was adjusted properly. Once you receive your scope of work. You should receive your first check which will include the Actual Cash Value of the claim. The Actual Cash Value is the total job cost minus your deductible and depreciation. Depreciation is recoverable once the contracted job is complete. Once the paperwork has been finalized, Hollywood Roofing will schedule a time for your work to be completed. Services are typically scheduled within 7-10 days; Depending on heavy schedules and the amount of hail damage in your area, it may be longer. City permits will be required by Hollywood Roofing. Materials will be delivered on site and the work will begin. Once completed Hollywood Roofing will call in a city inspector to make a final inspection. Congratulations on your new roof! Installed by a third-generation, experienced roofing contractor company.